Interesting developments - the assistant commissioner of Fiji police, Henry Brown, was arrested two days ago at Nadi Airport. The details are sketchy but it has been confirmed Brown was taken into custody on Easter Friday by the illegal prime minister's special task force. He was taken first to Nadi Military Camp and then to QEB to be interviewed. Fiji's Police Commissioner, Iowane Naivalurura, had fingered Brown and others deemed corrupt but who have also been investigating the 2006 Coup with CID officers. Moles say Naivalurua has clearly sold Brown and the other men out to protect himself. More ructions in what is already a troubled force. Brown was made assistant police commissioner just last year. He was the former director of police intelligence bureau. His name was in your list of corrupt Police Officers accepting bribes and drug money. I'd hazard a guess that Brown has been the Regime's target all along and that they have been waiting for him to drop his pants ( watch out for that M16 ) and spill his guts over where the evidence is hidden on Frank and the shadowy figures. Unfortunately for Frank and Co. the evidence has been long gone and is no longer only inside Fiji. The illegal Police Commissioner has shown his true colours now and has tainted himself with the same brush as Frank Bainimarama and there is no more stepping back for him. This theatrical play just gets funnier and funnier by the minute. hahahahahaha..vinaka Commissioner. One down three to go (Ligairi, Luke Navela and Rusiate Tudravu). They are licking their lips hoping that it will not run dry. The faster the better. Churi maro yaaaaarrrrr. History indeed repeats itself all the time. Dictatorships never fails to turn inwards, in self destruction. Every player does not trust each other, there is no democratic system of airing issues and differences except by backstabbibg and surprise elimination of opposition. Every player is on edge, insecure and survive by treachery, stealth and brutal elimination of suspected or real enemy. This is whats happening now within the military dictatorship. The system, going by previous dictatorship history, will soon collapse. FIJIAN LIUMURI AT ITS BEST NOW. POLICE OFFICER/PEOPLE OF FIJI SHOULD COMBINE AND FIGHT THE CORRUPT BANI/AG/CP NOW. TIME TO STAND UP AND FIGHT. BANI TOLD PUBLIC THAT ARMY OFFICER WONT BENFIT AFTER 2006 COUP. CON MAN NOW ALL ARMY OFFICERS HAVE THE SAY. SAD DAY FOR FIJI POOPLE. Fiji is going around in circles. Until Bainimagasona is removed, Fiji will continue to go backwards. New government in Vanuatu on Easter Sunday as a result of now former PM Kilman's actions at MSG in Fiji. He at Frank's bullying tactics agreed to Indonesia having observer status when it was decided at a ministerial meeting that Vanuatu would oppose Indonesia's observer status. Natapei who was leader of the opposition moved the motion of no confidence. Army never trust Police because they work close with criminals.I vote for S.Meo to take new assistant Police commissioner job baleta,rawa ni expose taki ira na vakayagataka tiko na yaca lasulasu in this blog site. Interesting developement - wonder if this isn't somebody's covering their collective arses're CRW deaths in custody connection? Let's chill...2014 is all we aiming for..all this rumblings are just means to that imminent end in this journey to restoration of democratic governance in Fiji. Problem with your 2014 theory Sem1 Meo is that there won't be much left of Viti by then - economicly or socially - and if you believe they'll accept an election decision without indemnity clauses for themselves your crazy. meow Semi meow meow meow!!! Meo do you really believe in a 2014 election? If that is the case you are bloody think in the head. Bainimarama is here for the long haul. No chance of the illegal PM leaving his post in 2014. If you believe that you also believe in fairy tales and that pigs can fly. Keep jailing indian businessmen and see Fiji go backwards. Meo na katia ga na mumu na gata. So much for the high flying General who stands there and allows his Deputy to be arrested by the military...not even the slightes protest. @ Semi Meo.......tukaqu, spoil taka tale o The Max na nomu plan. According to Semi Meo,this man Mr Brown was kidnapped by little privates in the Army without the knowledge of the Vuaka. Obviously Semi is either living in denial or he has serious senility problem. 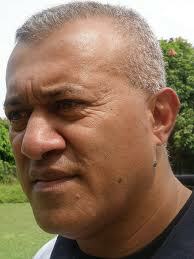 For a high ranking police officer to be kidnapped it obviously must be ordered by Vuaka himself. May I suggest Semi you get some medical assessment, because logic has deserted you. & Anon 7.37am, you have to excuse bothy SMeo for his 'head'issues. He probably forgot to take his meds again!!! @ boring ..boring a-nuni-mosi...yawn, why should we be cyber boxing with these cowards...next topic..